2 large artichokes, such as Sangria artichokes, Fiore Viola artichokes, globe artichokes, or 2 Smartichokes™. In large pan, heat 3/4 cup olive oil. On medium heat, sauté garlic, anchovy paste, and crushed red pepper 3-4 minutes. Remove from heat and let cool in pan. In medium bowl, using your hands, mix together bread crumbs, parsley, cheese, salt, pepper, and olives. Add cooled olive oil mixture to dry ingredients and mix with hands until crumbly. Set aside. If using Smartichokes™, cook per package instructions, then trim off tops. For other artichokes, rinse, then trim 1 inch off tops and 1/2 inch off stems. Snip off outermost tips of leaves if too pointy. Put water, artichokes, and sliced lemon in pot. Bring to boiling. Simmer 20-30 minutes until artichokes are tender (leaves should remove easily when pulled). Cooking time depends on artichoke size. Remove artichokes from water and place upside down on rack to drain. Allow artichokes to cool, then use metal spoon to remove “choke” (fuzzy, inedible portion) from center. Place artichokes right side up. Open artichoke leaves like a flower and fill with stuffing mixture. Stuff as many leaves as possible because the stuffing has great flavor! Place stuffed artichokes in shallow pan with 1 inch water; drizzle with remaining olive oil. Cover and bake 20 minutes, then uncover and return to oven for 10 minutes to crisp and brown stuffing. 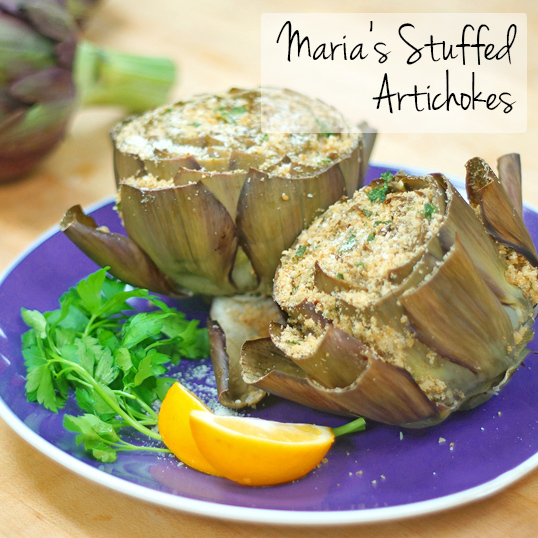 Option: Enjoy these stuffed artichokes at Maria’s Italian Kitchen! We’ll do the dishes!